At Budget Blinds of Marysville, we're your local neighborhood experts that truly understand your needs. We're in your neighborhood, we know the local Marysville weather and community, and we’re backed by the #1 provider of blinds, shades, and drapes in North America. Over 25 years of customer satisfaction gives you peace of mind that only comes with choosing the proven leader. We bring the showroom to you in Marysville. We expertly measure your space, install beautiful window treatments, and back it up with the best warranty in the business so you can sit back and relax in the beautiful, Marysville weather and sunshine. We serve to give you the best in window treatments, so you can rest easy knowing your space will be beautified and optimized with window treatments that fit your individual needs. Welcome to Budget Blinds serving Marysville, where form follows function…beautifully. Our highly trained, expert design consultants offer superior neighborhood service that promises to enrich your home environment and elevate your lifestyle. 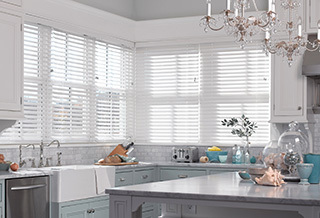 Whether it’s luster-rich custom shutters, versatile blinds, fashionable shades or elegant drapery, Budget Blinds serving Marysville is here for you and with pricing that fits any budget. Regardless of your window’s size or shape, our stunning collection of state-of-the-art window fashions will induce compliments from friends and family for years to come. And to make the design process both simple and enjoyable, we bring our entire gallery of window fashions to you with our FREE in-home consultation. The very essence of Budget Blinds of Marysville is intuitive service and attention to detail- we do it all for you. Right now is the perfect time to elevate your home’s interior and frame your windows in treatments you’ve always dreamed about. Whether you’re near the Seattle area, home to where the Seahawks play, or anywhere near Marysville, look to the experts at Budget Blinds serving Marysville and see why more homeowners choose us for a style and a smile for any budget. Very Prompt & Professional Beautiful Blinds! Thank you Bob for the Professional & Courteous service. We love how everything turned out. Bob the owner is fantastic. Very Professional. I would definitely recommend Bob to a friend.